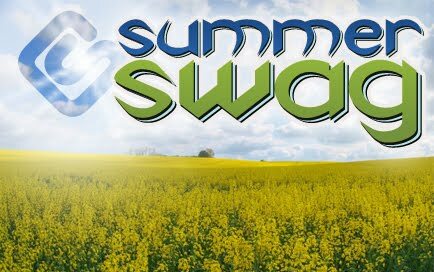 Summer of Swag Starts TOMORROW!! Let me begin by saying I am VERY excited about what Swagbucks has instore for its users this week. Beginning tomorrow, Swagbucks kicks off its "Summer of Swag" with means more goodies for everyone! If you are unfamiliar with Swagbucks.com it is a site that is free to use and awards you free points for doing something you already do: internet searching. The idea is to use their search engine instead of google, bing, etc and you will randomly be awarded points while doing it! You can then take those points - or swagbucks and redeem them for things such as MP3's, trading card and gift cards. My personal fave is the $5 Amazon.com giftcard for 450 swagbucks. I have redeemed 11 of them since January of this year and ordered some great stuff! Monday (TOMORROW!!) they will be giving out 5 swagcodes which can be ANY denomination swagbuck. Tuesday-Friday Every 7th search will be awarded the special bill of the day. Tuesday will be the 25 sb. The rest have not been released yet. code = Promotional codes that can appear anywhere (their toolbar that you can download from their site, Facebook Fan page, Twitter page, flicker pictures, or their blog posts)These are typically valid for about 3 hrs from the time they are released. Do signup for a free Facebook and Twitter account (you can keep them private)to be on the lookout for codes. If you see "Thanks TSG" a code has probably came out so check the swidget. DON'T share codes!! You can have your account closed and it takes away the fun of looking for it. DON'T list your referral link on the Swagbucks Facebook Page or Twitter (everyone is already signed up there and it wouldn't make sense to list it there.) Feel free to use your referral link on your own Facebook page and Twitter updates. DON'T create more than one account per household. You can create a family account. Check their FAQ's. Here's to a great week of swagbucks earning!